Space Holdings was an integrated multimedia company dedicated to capturing people’s fascination with space, science and technology across consumer, education and professional markets. 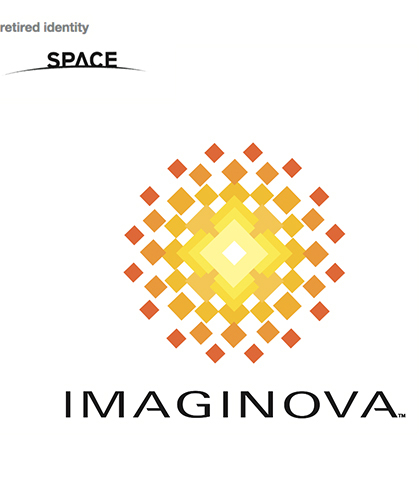 The name of the company was changed to “Imaginova” to better reflect the strengths of the organization’s core space-oriented brands while permitting the expansion of its successful business model beyond the space category into other areas of science and technology. Leader Creative was asked to develop a new corporate identity that leverages the significant equity in the Space Holdings brand while elevating the organization’s core attributes of dynamic, innovative, accessible and fun to encompass not merely astronomy, but also the larger concept: The pursuit and attainment of knowledge generally. The centerpiece of this powerful signature is a glowing nova which, by definition, is a star that suddenly increases its light output. So it is with the moment of epiphany—Eureka!—that delights Imaginova’s constituents in their pursuits of knowledge. While leveraging Imaginova’s roots in astronomy and space, the glowing sphere is also a reinterpretation of the proverbial light bulb as a visual metaphor for a fresh idea or insight.